Silverware Hardware by Knobware provides distinguished and elegant accents to any room. The face of this Knob is stamped out of Antique Nickel. This unique technique allows for unprecedented detail and quality. The Antique Nickel is chosen for its ability to match appliances and the tones of everyday hardware. Made of long term durability and superior quality. Diameter - 1 3/8 in. Dimension - 1 1/6 x 7/8 x 1 3/8 in. Silverware Hardware by Knobware provides distinguished and elegant accents to any room. The face of this Knob is stamped out of Black Nickel. This unique technique allows for unprecedented detail and quality. The Black Nickel is chosen for its ability to match appliances and the tones of everyday hardware. Made of long term durability and superior quality. Silverware Hardware by Knobware provides distinguished and elegant accents to any room. The face of this Knob is stamped out of Satin Nickel. This unique technique allows for unprecedented detail and quality. The Satin Nickel is chosen for its ability to match appliances and the tones of everyday hardware. Made of long term durability and superior quality. Silverware Hardware by Knobware provides distinguished and elegant accents to any room. The face of this Knob is stamped out of Nickel. This unique technique allows for unprecedented detail and quality. The Nickel is chosen for its ability to match appliances and the tones of everyday hardware. Made of long term durability and superior quality. Silverware Hardware by Knobware provides distinguished and elegant accents to any room. The face of this Knob is stamped out of Oil Rubbed Bronze. This unique technique allows for unprecedented detail and quality. The Oil Rubbed Bronze is chosen for its ability to match appliances and the tones of everyday hardware. Made of long term durability and superior quality. Silverware Hardware by Knobware provides distinguished and elegant accents to any room. The face of this Knob is stamped out of Venetian Bronze. This unique technique allows for unprecedented detail and quality. The Venetian Bronze is chosen for its ability to match appliances and the tones of everyday hardware. Made of long term durability and superior quality. 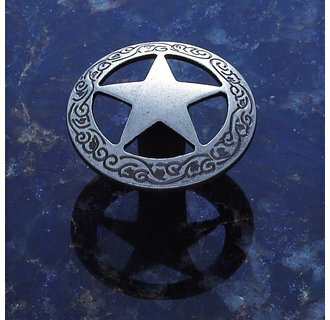 This stunning designer knob offers style and grace to any cabinet it is attached to. With its old west features and solid construction this will be a integral part of your home for years to come. Coordinates Well with Other Products from the Lone Star Collection.